No one weaves a tale quite like the greatest pirate in the galaxy, Hondo Ohnaka! The self-declared hero and incorrigible schemer has captured Jedi, led rowdy Weequay pirate gangs, and traveled from one end of the galaxy to the other in search of riches and fame. 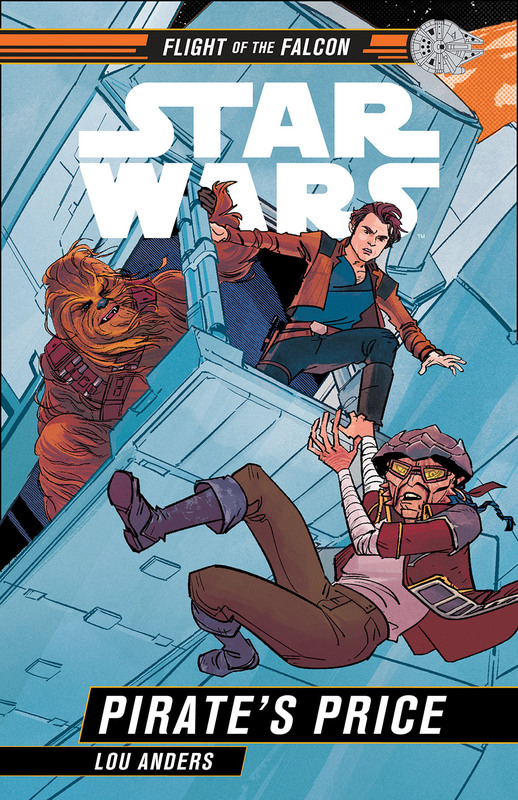 In his newest adventure, Star Wars: Pirate’s Price, a new book by Lou Anders and illustrated by Annie Wu as part of the Flight of the Falcon series, Hondo is back in the spotlight and — what else? — talking his way out of things, regaling feared bounty hunter Bazine Netal with stories of his heroic deeds aboard the famed Millennium Falcon. Today, StarWars.com is pleased to give you your first look at the opening pages from the new book as well as a glimpse at a second excerpt, torn straight from one of Hondo’s daring escapades. As many Star Wars fans and readers already know, soon you’ll be able to visit the planet Batuu and the village of Black Spire Outpost at Star Wars: Galaxy’s Edge, coming this summer to Disneyland Park and this fall to Disney’s Hollywood Studios. 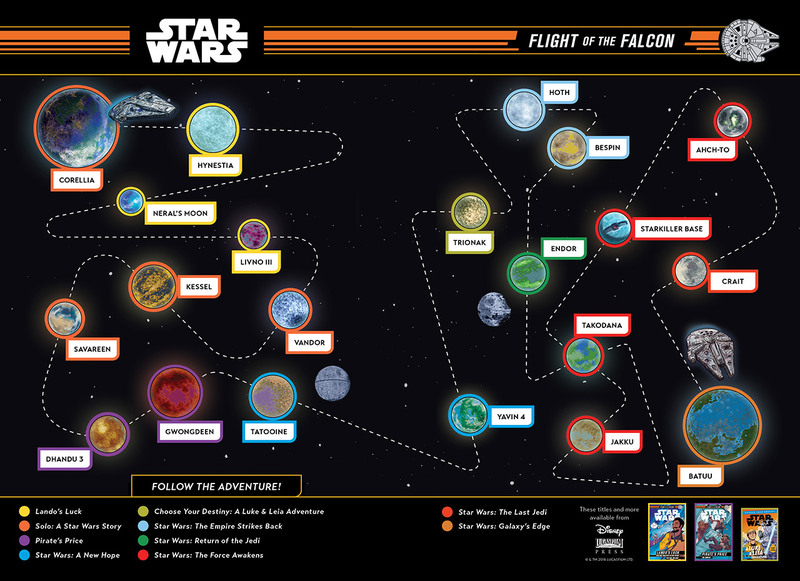 Learn about this exotic Outer Rim destination below and pick up your own copy for additional stories including Hondo’s run-in with the mighty Wookiee Chewbacca, the pilot and scoundrel Han Solo, and more. As far as wretched hives of scum and villainy went, Bazine Netal thought that Black Spire Outpost seemed friendlier than most. Certainly, the Trandoshan running the supply company was more than willing to point her in the direction of her quarry. He didn’t even ask her why she was looking for the Weequay. He just sold out his neighbor for a few credits. She moved through the crowded streets. Although she looked striking in her black leather skull cap and Rishi eel ink–tipped fingers, no one paid her any attention. The locals were used to all manner of beings coming and going. Still, Bazine knew better than to turn her back on any of them. Especially not when she was so close to her goal. She had been a long time getting there. After being led on a chase across the galaxy, she had tracked the Millennium Falcon to the planet Batuu and its infamous port—Black Spire Outpost. Glancing above the roofline of the buildings, Bazine could see how the place found its name. Rising above the shops and dwellings were the petrified trunks of what were once giant trees that had dominated the skies of that world. Now their blackened remains stood as silent sentinels on the outskirts of the town. The outpost was not an easy place to find unless you knew about it first. It was located where the Unknown Regions met Wild Space, a stopover for smugglers and those of less savory occupations—a place for rogues and opportunists, con artists, thieves . . . and of course, pirates. So it made a sort of sense that her target would be there. After all, the infamous Hondo Ohnaka had been all those things and more. Bazine’s intelligence had told her that the notorious Weequay scoundrel was there on Batuu, where he was running a shipping operation called Ohnaka Transport Solutions. Doubtless it was a thin front for a smuggling operation. But it didn’t matter to Bazine what it was. She wasn’t interested in his services—just his ships . . .or rather, one of them in particular. One very special ship. She found the old pirate in a busy cantina where a repurposed RX-series pilot droid was playing upbeat music to an audience that mostly ignored it. But there was Hondo. He was sitting at a corner table playing sabacc with a nervous-looking Ithorian, a furry Yarkora, and a grinning Suerton. Surprisingly, the Weequay didn’t even have his back to the wall. If she had gone there to kill him, he would already be dead. Fortunate for him, then, that she wasn’t planning to. At least she wouldn’t unless she had to. And that remained to be seen. Still, the way he had his back to half the room struck Bazine as unnecessarily careless and ridiculously trusting. It certainly spoke to his legendary overconfidence. In fact, Hondo wasn’t so much sitting in his chair as sprawling in it, a drink in one hand and three sabacc cards in the other. He wasn’t playing it close to the vest, either, but swinging his sabacc cards in time with the music. As she approached him from one side, Bazine could easily glance at his hand. He had a two, a three, and the face card known as a sylop, sometimes called the idiot. He was grinning like one, too, although, judging from the pile of credit chips on the table, it looked as though the Suerton was the one who was winning the most. “My friends,” said Hondo, his voice ringing out with a happy lilt that was almost musical, “I cannot tell you how much it pains me to take all of your credits today. But you make it too easy. And as my sweet mother used to say, if you’re going to bet, bet big.” He tossed an impressive handful of credit chips onto the growing pile in the center and waited for the others to ante up. “You’re bluffing,” growled the Ithorian from one of his twin mouths. “So you are bluffing?” asked the Ithorian, confused. “Bah,” growled the Ithorian from both mouths at once. But then the Yarkora spotted Bazine. He gave a little start, and it amused her to wonder which of his two stomachs had done a flip. “What is it?” said Hondo. “Have I got something on my face? I mean besides my so very attractive frills?” He brushed the backs of his fingers across the barbs that grew from his jowls. They had gotten longer as he had gotten older. Perhaps he thought they made him look distinguished. But then he caught sight of the newcomer out of the corner of his eye. The day started out like so many others. I woke up in a strange spacecraft. I was alone in the cockpit. The control console was smoking and sparking. Crackle, crackle, fizzle, spark! Oh, and it seemed that two Imperial TIE fighters were shooting at me. I had only the vaguest memory. I recalled something about a party, excitement and dancing. Oh, yes, and a strange drink called Sarlacc Juice. In hindsight, I don’t recommend it. Oh, and I think there was an Imperial garrison commander. He was the one doing the dancing. By “asked,” you understand, I mean I was firing blaster bolts at his feet. And he was hopping about so as not to get shot in the foot. It was so amusing, for me at least. But perhaps he was not having as much fun. So that explained why the Imperial TIE fighters were shooting at me. Well, there is always a price for a good time. And this was another good time. But all good times must end. And the strange ship didn’t look like it was going to last much longer, not with the smoking and the sparking and the shooting—keeooo-keeooo!—and everything coming apart around me. So I looked for a place to land. There was a planet up ahead. The navicomputer said it was Galagolos V. Do you know it? It is one of those swampy, stinky planets. Not much to look at and you have to be careful where you put your feet. But beggars cannot be choosy when their ships are on fire, I always say. I went careening through the atmosphere, black smoke billowing behind me. It must have really been quite a sight. And do you know, it was a perfect three-point landing. By that I mean, I hit three separate points before I finally came to rest. What was left of the ship skidded to a stop right in an empty docking bay. At least I think it was empty. There were some bang-crash-crunch-crunch noises at the end before I stopped moving. I hopped out quickly. The service droids were getting excitable. “Sir, sir, you can’t dock here,” they said, rushing up to me and waving their metal arms about. I tossed them a handful of what might be credit chips. Or maybe just pieces of the control console. “Keep the change,” I said. Then I rushed through the doors before they could stop me, and I was in the spaceport proper. I hoped to quickly lose myself in the crowd. Oh, it was a busy place for such a stinky, swampy planet. That was good. But the air was all sweaty and wet. Sticky, sticky. Nothing like the dry heat of my beloved Florrum. It was no matter. I didn’t plan to stick around for long. But to get off that stinky ball, I would need a new ship. That was, of course, merely a momentary setback for a great pirate such as myself. And there I was lucky enough to have crashed in a spaceport. Opportunities abounded for the unscrupulous and the bold. And I am both of those things. I began to look around. So many people. And I did not know any of them. The day was alive with possibility. I had a feeling that something was bound to happen. Pre-order your copy of Star Wars: Pirate’s Price today!